Most employers can relate to employee engagement and the need to maintain it across?the workforce. 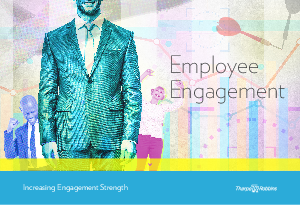 One important fact of employee engagement is simple — the stronger the engagement, the higher the productivity. Lower engagement results in decreased individual productivity and overall company performance. Left untreated, low engagement over time can?lead to disengagement and detachment. Engaged employees will result in reduced turnover, a stronger overall commitment to the organization, and better financial outcomes. Individual ESS can be measured, and the overall ESS of a workgroup or company can be calculated to get an average or “mean” score. The average ESS score?for a new employee in many companies is the maximum five bars. They are engaged, excited, and want to do their best. Maintaining that engagement is key to creating and sustaining a productive work environment and keeping employees focused and engaged. There are several areas that impact engagement signal strength. Creating a culture of caring — A caring work culture is paramount for a successful company. It is also important to earn and keep the trust of all employees. Building connections — Employees who like their fellow workers and want to socialize with them outside of work are more likely to be engaged. Providing a positive work environment — An environment where good work is praised, great work is rewarded, and poor performance is promptly addressed increases employee engagement. Developing strong leadership — Company leaders need to be trustworthy, caring, direct, and consistent. These leaders should truly believe in the importance of those characteristics. Educating supervisors — Supervisors need to know how to interact positively, motivate through caring, earn respect, show gratitude for a job well done, and recognize outstanding performance. There is a lot of research available on the Internet, and evaluating that data can be challenging for busy managers and committees. You may be unsure of where to find market-proven advice and confused about which business rules and program designs will produce the best outcomes for you. TharpeRobbins is a recognition service provider that develops strategies, solutions, and programs that have a positive impact on employee engagement and ESS. We know that the higher you can drive the individual, team, and overall company ESS, the greater the impact it will have on your company’s bottom line. Our approach focuses on outcome-based program design. Subject-matter experts at TharpeRobbins do the work for you by staying current on the latest research and publications. They talk with hundreds of clients and companies on a regular basis and are experienced with designing single-purpose and multi-system recognition programs.